Turkey electing Erdogan for a third term is BAD NEWS for the whole world. There is no doubt that Islamist Edrogan will consolidate his Islamist control in Turkey. The used-to-be apparently friendly relations between Turkey and Israel have become hostile since the Islamist Edrogan came to power in 2003. Now Edrogan and his Islamist party, encouraged by Hussein in the Whitehouse, can have Turkey become a radically Islamic nightmare. Edrogan has constructed a police state, hostile to Israel, closely tied to Iran, where Turks are afraid to talk on the phone because they know how their homes and businesses are bugged, and journalists no longer have freedom to report the real news in Turkey. This is one of the things we knew would happen BEFORE the full strategic destruction of World War Three and the battle of Armageddon. Turkey was the most secular of the Muslim countries until Edrogan came to power, bringing his Muslim religious government that has continued to grow into more full, tight, total control. That makes Cyprus quite an intense place, to say the least. There are over 40,000 Turkish troops permanently stationed in the northern part of this small, and very strategic, island nation, just 50 miles north of us. Cyprus suffered the greatest act of international piracy in the last 100 years, in 1974, at the hands of Turkey. The set-up of that Turkish piracy of Cyprus was one of the deals of Henry Kissinger in the US state department. The silence about that HORROR is pitiful. It is also noteworthy that the most frequently visited country, of the antichrist prince, is Turkey. The main reason that the Greek Cypriots voted so overwhelmingly against the Kofi Annan, UN plan for the reunification of Cyprus, was that Turkey made it clear that they would NOT withdraw their troops. Turkey used to be the only Muslim nation with which Israel enjoyed full diplomatic, economic, and friendly relations. That status has radically changed with Edrogan's Muslim religious regime. The Turkish Prime Minister Erdogan has accused Israel of state-sponsored terrorism, and Erdogan has vowed to break Israel’s LEGAL blockade of Gaza. Who could forget the damage done and hostility generated from the last such floatilla attempt with 3 ships and about 500 demonstrators? The next attempt to break the LEGAL blockade of Gaza, Erdogan has promised Turkish war ships to join in. We are thankful to God that Cyprus has given no place to such blatant provocation, which would be the antithesis of anything remotely related to PEACE. There can be no question that Turkey is NOW very definitely moving in the direction the Bible says it will move in the Last Days of the great tribulation antichrist war on the saints. It looks like Turkey has decided to turn away from the Western nations. The Bible is clear this would occur. Any sort of good relations that the United States may have had when Hussein illegally began occupying the Whitehouse are in SHAMBLES. Muslims are now united in their belief they can destroy Israel and to start a big enough war to bring forth the Mahdi and establish a global Islamic Caliphate. So where do we find Turkey in the Bible? TOGARMAH, means Son of Gomer, and is the name of a region of Asia Minor, today known as Turkey. That is where you find Turkey in the Bible. Togarmah, or Turkey, is VERY important regarding the few last days references to that nation, doing what it NOW appears they are, IN FACT, doing. Turkey is breaking with Tarshish, AMERICA, and Israel. WE KNOW A MAJOR SIGN OF THE GOG-MEGOG WAR WOULD BE TURKEY TURNING AWAY FROM THE WEST AND TOWARD THE RUSSIAN LED ARAB CONFEDERACY AGAINST ISRAEL, AND THE UNITED STATES. It is astonishing how few recall that the Arab Muslim states have historically been Russian military client states. Russia has had Military Advisors in Gaza for the past seven years, to help the PA terrorists. They are also in Lebanon. Also under reported, is that since the FORCED forsaking of Gaza, and since Obama helped overthrow Mubarak, all security and protocol agreements between Israel and Egypt, as a result of that Camp David treaty between Sedat and Begin, have disintegrated. Ezek 38:6-13 Gomer, and all his bands; the house of TOGARMAH of the north quarters, and all his bands: and many people with thee. Be thou prepared, and prepare for thyself, thou, and all thy company that are assembled unto thee, and be thou a guard unto them. After many days thou shalt be visited: in THE LATTER YEARS thou shalt come into the land that is brought back from the sword, and is gathered out of many people, against the mountains of Israel, which have been always waste: but it is brought forth out of the nations, and they shall dwell safely all of them. Thou shalt ascend and come like a storm, thou shalt be like a cloud to cover the land, thou, and all thy bands, and many people with thee. Thus saith the Lord GOD; It shall also come to pass, that at the same time shall things come into thy mind, and thou shalt think an evil thought: And thou shalt say, I will go up to the land of unwalled villages; I will go to them that are at rest, that dwell safely, all of them dwelling without walls, and having neither bars nor gates, To take a spoil, and to take a prey; to turn thine hand upon the desolate places that are now inhabited, and upon the people that are gathered out of the nations, which have gotten cattle and goods, that dwell in the midst of the land. Sheba, and Dedan, and the merchants of Tarshish, with all the young lions thereof, shall say unto thee, Art thou come to take a spoil? hast thou gathered thy company to take a prey? to carry away silver and gold, to take away cattle and goods, to take a great spoil? YES, that which we see in Eze 38:10-13 is about the Russian strategic NUCLEAR attack of America. The effect of every vision is NOW at hand. Now, we all really need to be pressing into the Mystery of the Ages, and going to the More Sure Word to build up our most holy FAITH, that is the victory over fear. These are incredible times. We can and should make a difference. Would you consider sending this to 20 other people you Know, and ask them to send it to twenty others? Jew or Gentile, it does not matter. The truth is what sets us free and keeps us free. Truth is not found through the antichrist controlled media. These 23 simple truths can set free from the strong delusion of the prince of the power of the air, regarding the Israel conflict, which looks to be the trigger for WWIII. 1. Nationhood and Jerusalem. Israel became a nation in 1312 B.C. that is approximately two thousand years before the Roman pope put Mohammed in the religion business. Israel was a nation with Jerusalem as its capital for about 2,000 years before there was any such religion as Islam. 2. Arab refugees in Israel FIRST BEGAN identifying themselves as part of a Palestinian people in 1967. It is easily a verifiable modern historical fact that it was ONLY about 20 years after the establishment of the modern State of Israel, that Muslim Arabs in the Mountains of Israel FIRST BEGAN to call themselves Palestinians. 3. Since the Jewish people conquered the land of Israel in about 1272 B.C., the Jews have had dominion over the land today known as Israel for over 3,000 years. The Jewish people have had a continuous presence in the land for the past 3,300 years. 4. The only Muslim Arab dominion of Israel and Jerusalem in the past 3,000 years was a Muslim conquest in 635 A.D. which lasted only 22 years. 5. For over 3,300 years, Jerusalem has been the Jewish capital. Jerusalem has never been the capital of any Arab or Muslim entity. Even when the Jordanians ILLEGALLY occupied Jerusalem, they never sought to make it their capital, and Muslim Arab leaders did not come to visit Jerusalem when Jordan briefly possessed it. 6. Jerusalem is mentioned over 811 times in the Holy Bible, and Zion another 152 times. Jerusalem is NOT mentioned ONCE in the Muslim holy book known as the Koran. 9. Muslim Arab and Jewish Refugees: In 1948 the Muslim Arab refugees were encouraged to leave Israel by Muslim Arab leaders promising to purge the land of Jews. Sixty-eight percent left before the Muslim Arabs attacked. 10. At the SAME time the Jewish refugees were forced to flee from Muslim lands due to Muslim brutality, persecution, and pogroms. 11. The number of Muslim Arab refugees who left Israel in 1948 is estimated to be around 630,000. The number of Jewish refugees from Arab lands is estimated to be the SAME. 12. Muslim Arab refugees were INTENTIONALLY not absorbed, or NOT integrated into the Muslim lands to which they fled, despite the vast Muslim Arab territory. Out of the 100,000,000 refugees since World War II, the Muslim Arab so-called, or recently called Palestinians, is the ONLY refugee group in the world that has never been absorbed or integrated into their own peoples' lands. Jewish refugees were completely absorbed into Israel, a country no larger than the state of New Jersey. 13. The Muslim Arab - Israeli Conflict: The Muslim Arabs are represented by EIGHT separate nations, not including the Palestinians. There is only ONE Jewish nation. The Muslim Arab nations STARTED the modern wars over Israel. 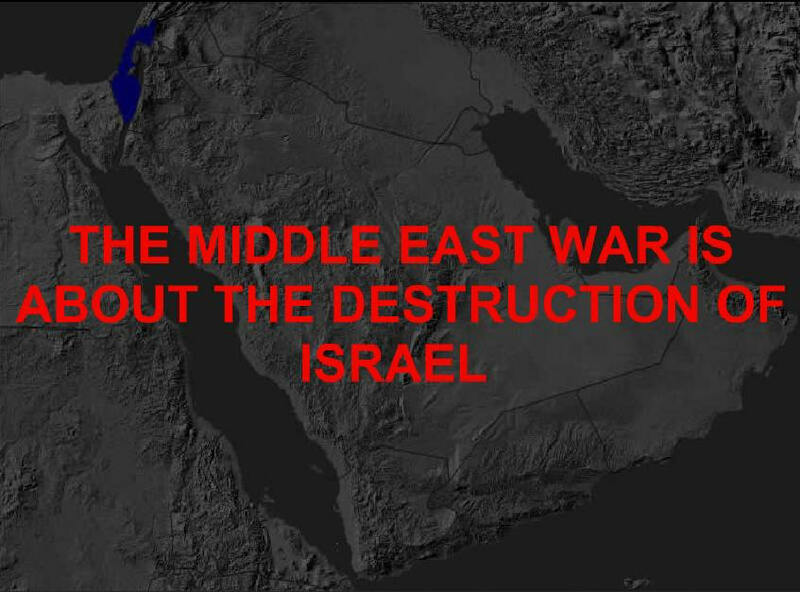 All FIVE wars began with the Muslim Arabs, as unprovoked aggressors, attacking Israel. The Arabs LOST all five wars that the Muslim Arabs started. Israel defended itself, and by the manifest miracle power of God, againstall odds, each time, and won. 14. The PLO's Charter STILL calls for the destruction of the State of Israel. Israel has given the Palestinians most of the West Bank land, autonomy under the Palestinian Authority. The problem is that Muslim Arabs want to destroy Israel and kill all Jews & Christians. 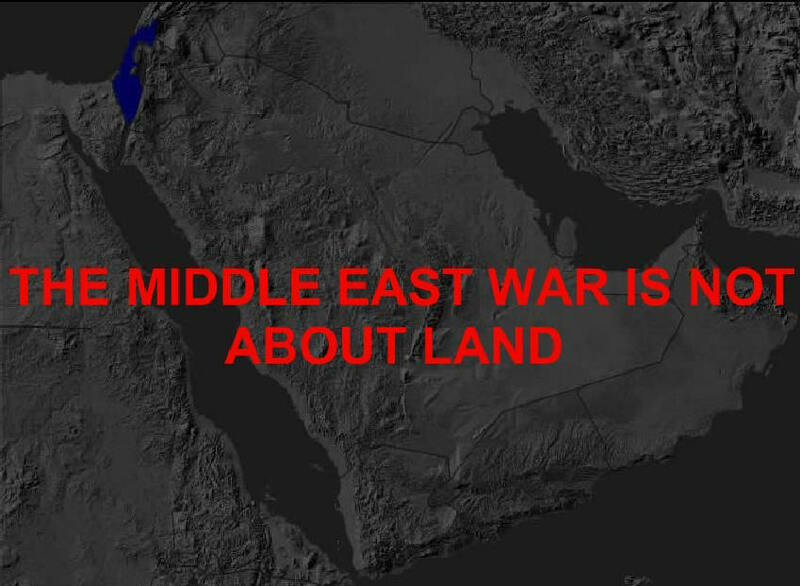 Land is NOT what the Muslim Arabs want. The Muslim Arabs have 600 TIMES as much land than the Jews. The Muslim Arabs want Israel destroyed, and every Jew and Christian DEAD. 15. Under Jordanian rule, Jewish holy sites were desecrated and the Jews were denied access to places of worship. Under Israeli rule, all Muslim and Christian sites have been preserved and made accessible to people of all faiths. In 1981 Jordan officially gave up any and all claim to the West Bank, Mountains of Israel. 16. Israel has the ONLY LEGITIMATE claim to the Mountains of Israel, also known as the West Bank. In 1981, even Jordan, which had illegally claimed East Jerusalem and the West Bank, Mountains of Israel, OFFICIALLY RENOUNCED, any and all claim to the so-called West Bank, “occupied territory” of East Jerusalem and the Mountains of Israel. 17. The Palestinians are Muslim Arabs who belong in any of the Muslim Arab states, and who DO NOT BELONG IN ISRAEL WITH THEIR DENIAL OF JEW’S RIGHT TO EXIST, AND DENIAL OF ISRAEL’S RIGHT TO EXIST. Palestinians need to GET OUT of Israel rather than to carve out a state for themselves to strengthen and facilitate their Arab Muslim will, to destroy Israel. The Muslim Arab position has been very open and clear since 1967 - NO PEACE WITH ISRAEL – NO RECOGNITION OF ISRAEL – AND NO NEGOTIATIONS WITH ISRAEL. 18. Why then must everyone FORCE Israel to try to appease and accommodate their attackers, and even be forced to give them territory within the legal and historic land of Israel, to be a front for attacking and destroying Israel? 19. The UN Record on Israel and the Arabs: of the 175 Security Council resolutions passed before 1990, 97 were directed against Israel. 20. Of the 690 General Assembly resolutions voted on before 1990, 429 were directed against Israel. 21. The U. N was SILENT while 58 Jerusalem Synagogues were destroyed by the Jordanians. 22. The UN was SILENT while the Jordanians systematically desecrated the ancient Jewish cemetery on the Mount of Olives. 23. The UN was SILENT while the Jordanians enforced an apartheid-like policy of preventing Jews from visiting the Temple Mount, and the Western Wall. 24. God Almighty clearly and explicitly says to make NO covenant with them (Muslim Arabs, AKA Palestinians) in Ex 23:32 and Deut 7:2. It is no wonder why God would make such a command when the Muslim Arabs, since losing the 1967 Six Days War, have ALL made it clear over and over with 100% broken promises – NO PEACE WITH ISRAEL – NO RECOGNITION OF ISRAEL – AND NO NEGOTIATIONS WITH ISRAEL. Gentile or Jew, it does not matter. Even the Muslim should have a chance to see the truth. It would be good for the Muslim to have a chance to make an informed choice. Without this truth the Muslim does not have a chance to know if it is right or wrong to join and participate in the Global Jihad. This Global Jihad is being used by the antichrist illuminati Luciferian Satanists to foment the killing and destruction of WWIII. War is considered good business by these international banksters, who worship Lucifer as their god. Israel should IMMEDIATELY and OFFICIALLY ANNEX the Mountains of Israel. America should IMMEDIATELY MOVE HUSSEIN from the Whitehouse to the Jailhouse where he belongs. PRAY FOR THE PEACE OF JERUSALEM. Psa 122:6 Pray for the peace of Jerusalem: they shall prosper that love thee. There is hope of peace where you are if there be peace in Jerusalem.